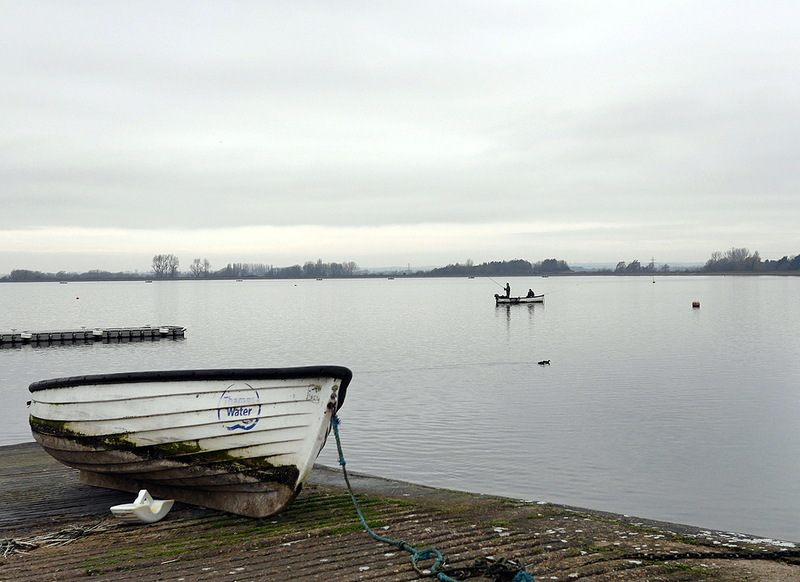 A short notice trip to Farmoor, I got an invite on Wednesday from Steve Cullen to go fishing on Sunday. After some negotiations with the long haired General it was on. 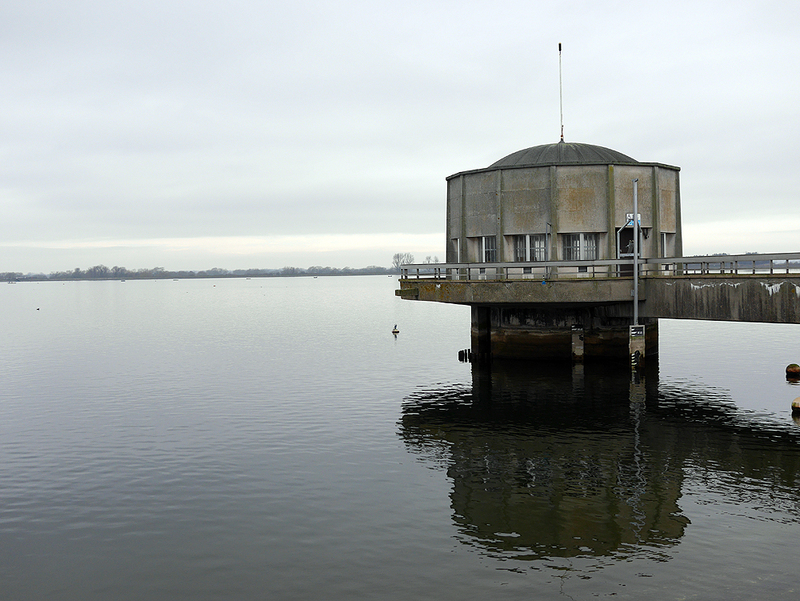 I had never been to Farmoor before even though it is only just over an hour from my home. The venue is not going to win any prizes for the prettiest fishery in the country. It’s essentially a concrete bowl filled with water, so what’s the attraction? The bank fishing is supposed to be superb and the quality of fish are reputed to be very good. Anyway, what’s the worst that could happen a day of freezing cold wind and a bit of banter with Steve. Although the blog is little populated for this year I have had a few trips to the river Avon but they have proved so uneventful I could not muster the enthusiasm to record them. I was to meet Steve at 1000hrs but traffic was so light I was well early. I spent a little time looking around, lots of sailors and anglers about. I watched a couple of the bank anglers catching fish they seemed to be fishing in pairs and when one would catch the other would slide down the side of the dam and net the fish, teamwork in action! Steve soon arrived and informed me that I would not need much a reel, rod, DI8 and a box of boobies. We squared up the tickets and got into one of the boats that Steve had booked up. The fishery has a few boats but not many and I would advise that if you’re going to pay a visit and hope to fish from a boat you best book. The setup was simple enough two boobies on a long leader cast out the back of the boat pay out a little more line then hang on. There was a wee bit more to it than that but essentially that was it. It made sense to me it was Baltic the water was freezing the fish would be on the deck. There was action from the off really and after I struck at my first couple of offers to no avail Steve counselled that you had to just let it tighten up. Fishing with heavy gear it’s hard to appreciate how good these fish are and as I got the first fish to the boat only around two and half pounds I was struck by the quality. 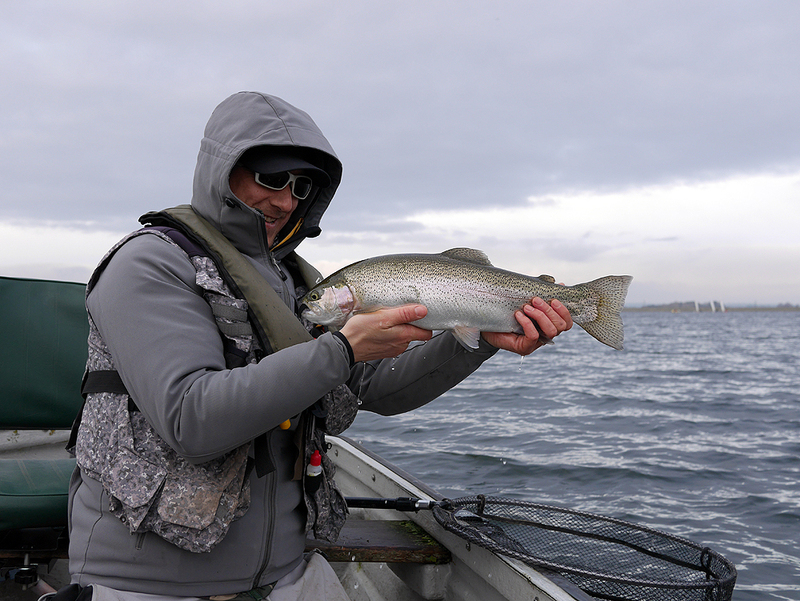 The fish was a bar of silver more akin to one of the Grafham fish that you get out in the middle mid-season. The tail was perfect and big; the fish was long and lean and we were off the mark. The first fish had taken my top dropper which was a small booby blob it went on to catch several more fish, one for the back pocket. I was experimenting with some new patterns and was very pleased with the results. The fish were coming steady with lots of takes and interest, everywhere bar one drift that Steve took us we were rewarded with some sport. The day had started pretty mild but as the wind picked up it cut through us like a sharp knife despite the numerous layers we were wearing. It’s funny though the cold does not seem to bother me when the fish are coming thick and fast. I had thought we were doing OK but Steve informed me that this was a pretty slow day. If this was slow I can’t wait to get back when its picked up a bit! The general stamp of fish were excellent hard fighting silver torpedoes. We had made our way around the bowl and arrived at the causeway just as a large group of bank anglers were packing up. 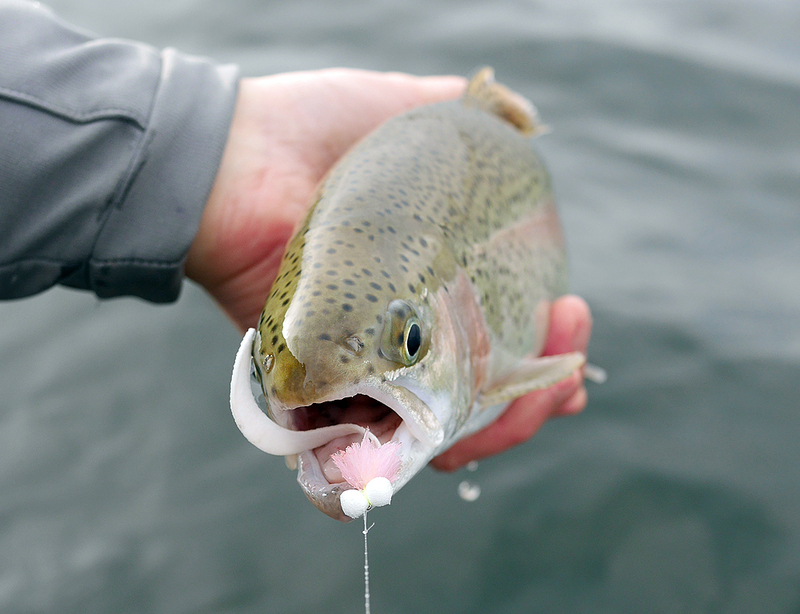 As we were drifting up I tightened into another fish as it neared the boat it was clear that it was a decent fish. After a dogged fight from the fish I eventually coaxed it into the waiting net. While all this was going on Steve had also hooked a cracking fish and had played it to the boat. After quickly releasing his fish Steve did the honours with the camera and I was fairly sure that this was going to be the fish of the day a solid three and a half pounds with a rudder for a tail. After re-drifting the same area for not so much as a knock it was time to move around so we made our way a little further round the bowl. It was a lot more comfortable here, at the top of the wind and the cold was a little less biting. This was the area we found the fish in numbers and although the stamp was a little smaller the fish still fought like stink. I don’t recall now which drift it was but we were catching plenty when I hooked into a fish that came straight to the surface and started to fight in the top layers of the water. Steve could see it better than I and exclaimed it was a good fish. To be honest it did not feel particularly big but I gave it the respect due a decent fish and played it out sensibly. I was so pleased I did, once the fish was in the net it was very obvious that the hook hold was a tenuous one it was only very lightly hooked and as I reached to retrieve the fly it parted company with the fish. 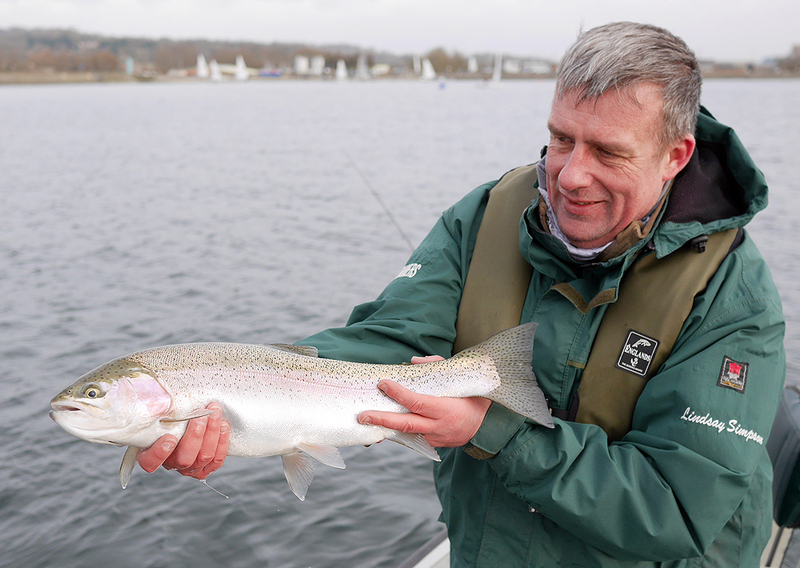 It was an absolute cracking fish and exactly what Farmoor is famous for. A quick photo before being safely released it had made my day. We continued to do the same drifts and you could almost predict when you were going to get a fish or a bit of interest. We had located two bands of fish which gave us both plenty of sport. The sailing boats were very friendly some coming so close that we could have exchanged numbers! To be fair though there was no harsh exchange of words as can occur at some other venues and a few were downright pleasant asking how our fishing was going. I had really enjoyed the day and with twenty-five fish to the boat in a little under six hours we had made the best of it. The cold had taken its toll on me though and I was completely frozen to the core. Lesson learned more layers for the next trip and there will definitely be one. Forget the scenery go for the fish and you won’t be disappointed!